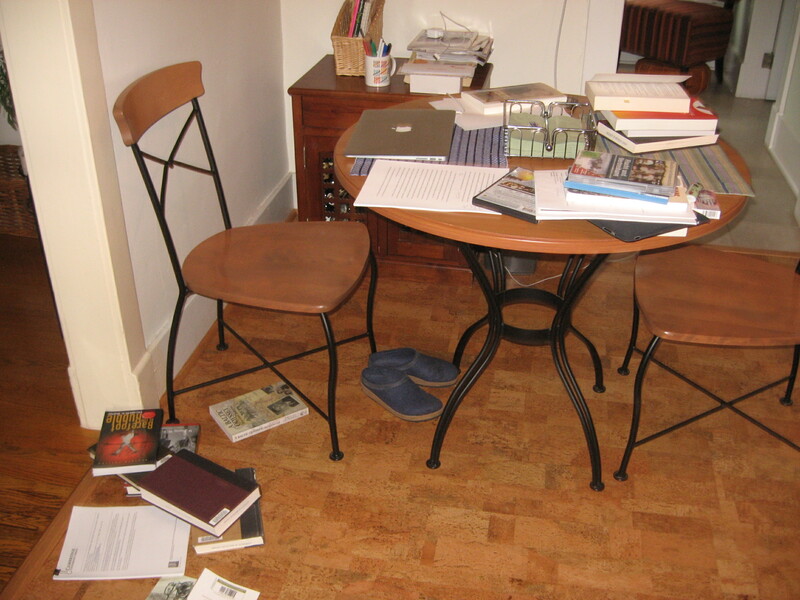 I have asked my colleagues and graduate students in the department to send me a picture of where they write. I’ll post a gallery on the departmental blog soon. The idea was inspired by taking a photo of my own messy work space last week. I have a perfectly fine office upstairs in my house, but I don’t write there. I have a perfectly fine office at the university, but I don’t write there. I write either on my dining room table or the kitchen table. It’s all about having a lap top and the space to spread my research materials around me. Plus the coffee is closer. I’m deeply into writing this article–and it’s due this coming week, so the impending deadline has motivated me to get on with it. I am so focused on writing this article that teaching is a bit of a distraction. On the day this photo was taken I had started at about 11 am and didn’t look up until almost 4 pm. I forgot to eat lunch. I was still wearing my yoga pants and a nasty t-shirt. House wear. My neck and shoulders were sore (no doubt because I’m not writing in an ergonomically sensible space. I was and am absorbed.